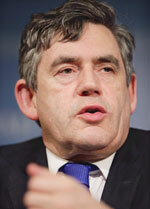 Piers Morgan has admitted that his best friend Gordon Brown has offered him a job in the Government. Rumours about the appointment started after the gregarious ex Daily Mirror editor talked about it incessantly on numerous TV programmes. Gordon's wife Sarah also poured more fuel on the fire by twattering about Piers being the best man on the job. Piers who is to be head of the newly formed showbiz department was said to be be looking forward to dealing with the nitty gritty of what was wrong with this country. Piers declared that having travelled around the country looking at all the poor deluded souls trying desperately to get 15 minutes of fame by shoving shuttlecocks up their arse or other such nonsense had prepared him very well for the job in hand.